When Pierre-Paul Riquet made plans for a canal in France between the Mediterranean and the Atlantic in the 1600s, it is likely that he did not have in mind a route for luxury barge hotels, but the Canal du Midi that used to carry wheat and wine now carries tourists and I was fortunate to be one thanks to European Waterways. France has over 3,000 kilometers of canals that crisscross the country. All of them fill with tourists in the summer months. Many of these in rented “plastic boats” but some in old freight barges that have been turned into floating luxury boutique hotels. 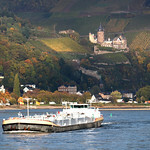 The Hotel Barge Enchanté is one of these barges. When I mentioned to my wife that we had an opportunity to sail on a luxury hotel barge it was the word “barge” that she focused on at first. People who we mentioned our trip to got a funny look on their face and would ask if the barge had cabins. The word that you should focus on is “luxury”. 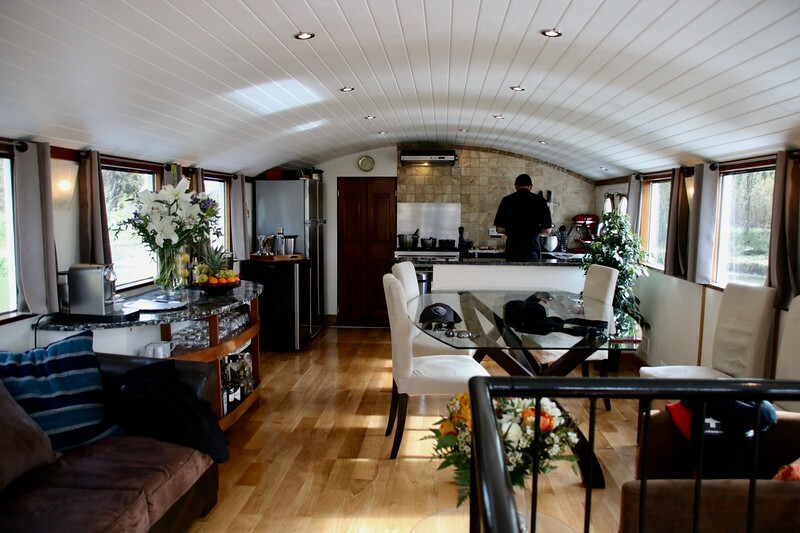 Owners Louisa and Roger Gronow converted an old freight barge into the luxury hotel barge it is today. 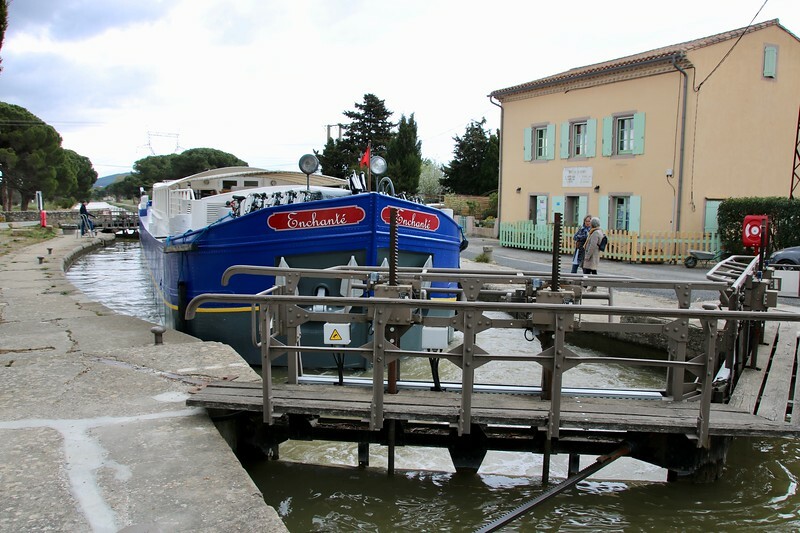 They created it especially for the Canal du Midi. It is unusually tall, at 2 stories tall, for the hotel barges on the canal. Most of the other hotel barges are a story and a half. The Enchanté needs to carry 80 tons of ballast to ride low enough in the canal so that its wheel house will clear the lowest bridges. It is the deepest boat that cruises the canal. 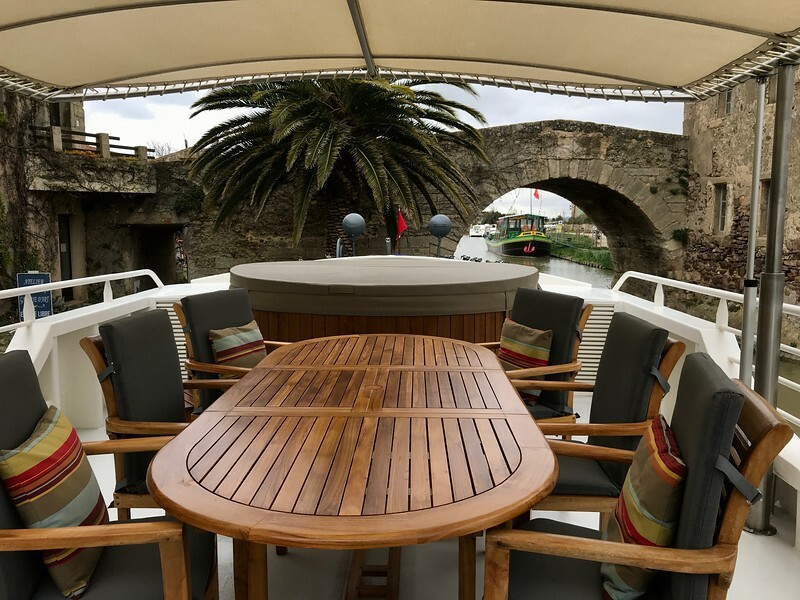 Even at that the new sunshade over the outdoor dining table, that was installed last season, has hydraulics so that the captain can raise and lower it from his perch at the back of the boat. The barge that the Gronow’s bought was still filled with sand and gravel that they had to shovel out before the conversion work started. 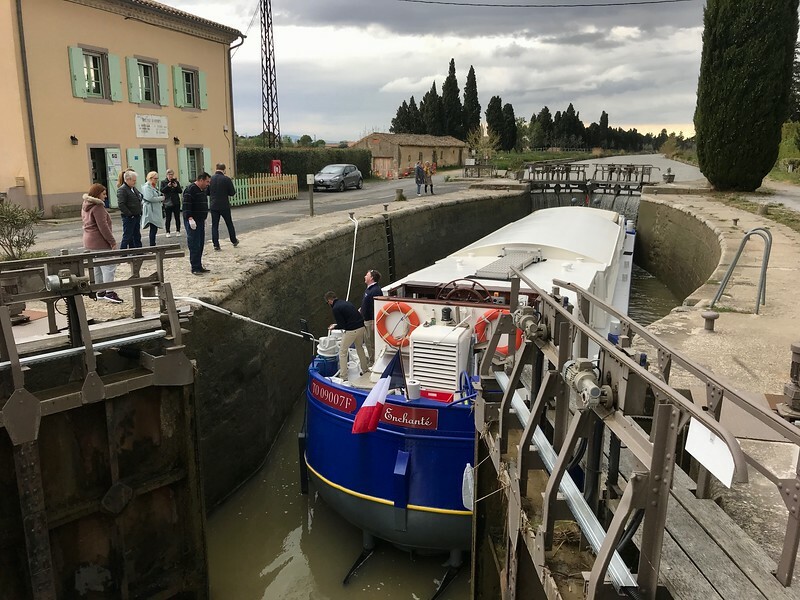 The very first project was to cut the ship in half to remove an 8 meter section and convert a 38 meter long freight barge to a 30 meter (about 100 feet) long hotel barge that would fit in the locks on the Canal du Midi. Their second boat the Finesse is 39 meters long because it operates in Burgundy where the locks are longer than on the Canal du Midi. At least one bridge we passed was so low the the captain had to take the large steering wheel off of its axle to clear it, but for most he just had to duck. The passenger part of the Enchanté is the front two thirds of the boat with the crew area and the wheel house in the back. In the front of the boat are storage for a set of 8 foldable bikes, followed by a jacuzzi and an outdoor dining table. Behind this are a set of spiral stairs down to the passenger cabins, a lounge area with a couch and some chairs, then the glass dining table and open kitchen area. The Enchanté has two levels with its 4 two person passenger cabins downstairs. 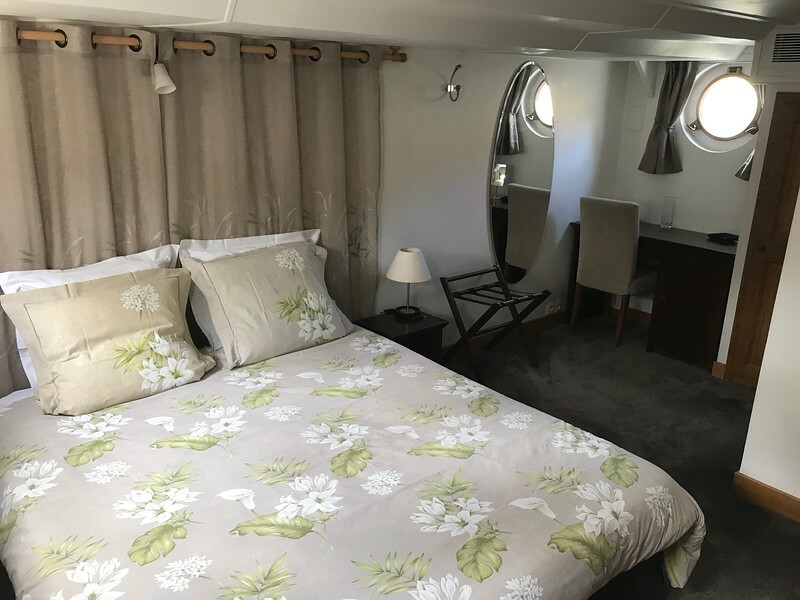 Below decks both the Enchanté and the Finesse have 4 passenger cabins with two single beds or one double bed. So each boat only carries 8 passengers at most. 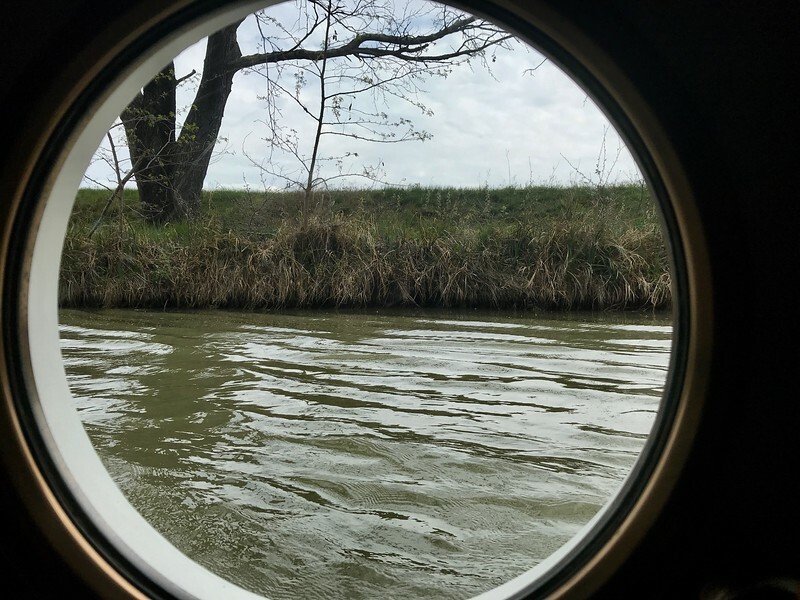 From the cabins the portholes open up on a view of the waterline of the canal. 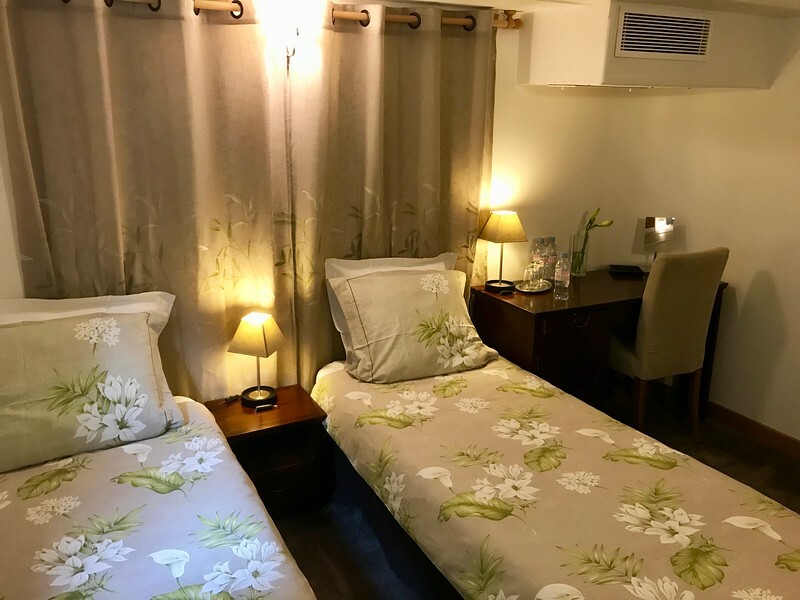 Each cabin has an ensuite bathroom with shower, sink and toilet. 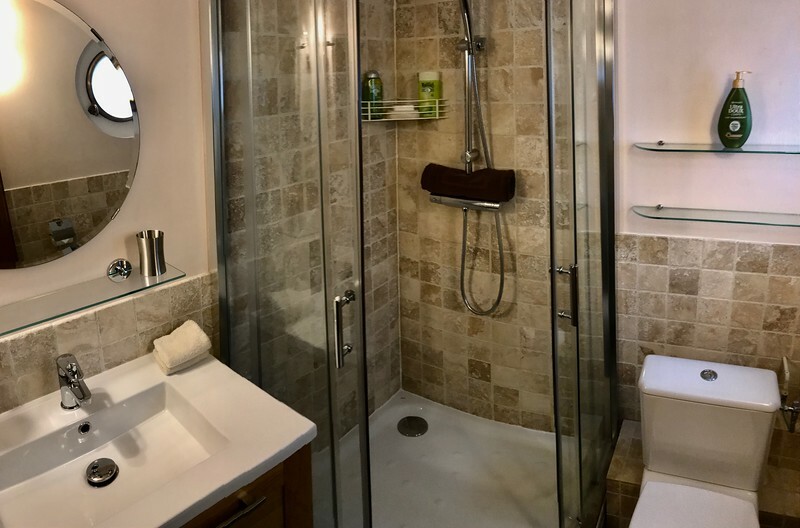 The bathrooms are tiled with stone tile work. Sailing in the first week in April we were on the first cruise of the season so we only had 4 passengers. 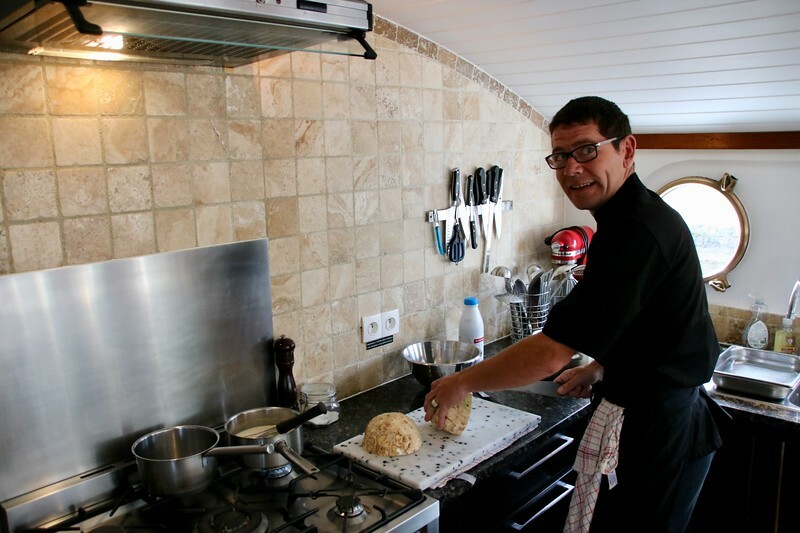 When Roger started as a captain with European Waterways 20 years ago the same size barge as the Finesse carried 24 passengers in bunk beds but passengers these days want more space, more excursions and better food than in those days. 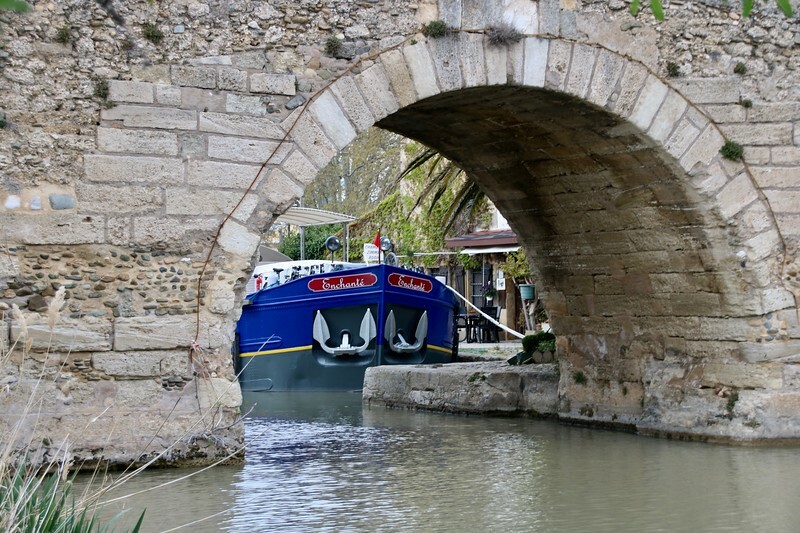 The Canal du Midi was an engineering marvel when it was finished in 1681. Many naysayers told Riquet that the canal would not have sufficient water to operate but not only were they wrong but the canal has been operating since 1681. Riquet died a year before the canal was completed so he never had the opportunity to say whatever the 17th century’s version of “I told you so” was. His family owned the canal for more than a century until the French Revolution but it did not pay off its original investment until 100 years after it started operating. 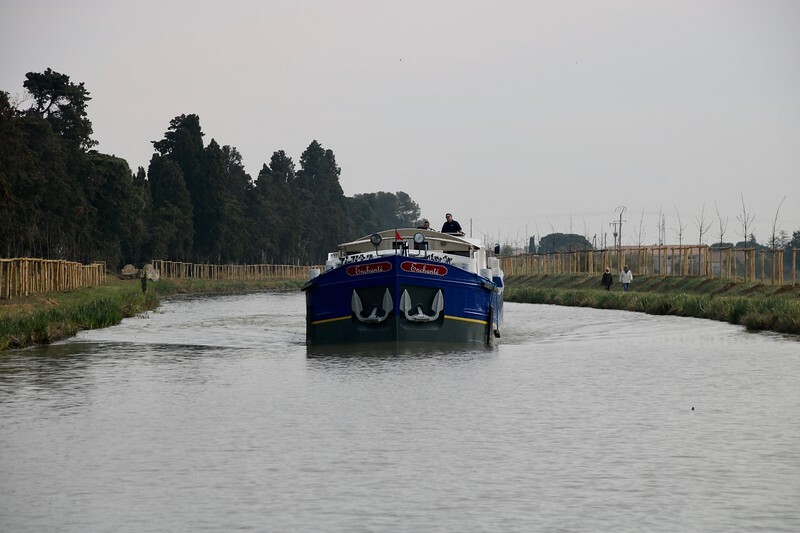 The canal is 240 km (~150 miles) long and connects the Garonne River (with cities Bordeaux and Toulouse) to the Mediterranean near Narbonne and Sète. 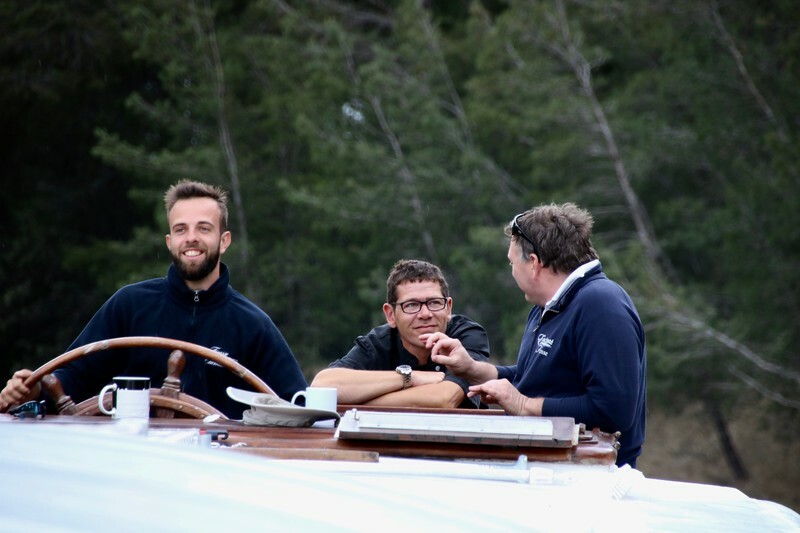 We were cruising a smaller portion between Le Somail and Trèbes. The hotel barges used to cruise for longer distances and for more time but the passengers got a bit of cabin fever so now we spent about half of the day out exploring the countryside and only 2-3 hours cruising. If you have seen pictures of the Canal du Midi you have probably seen a canal lined with Plane Trees (a tree related to the Sycamore) but over the last 5 years many of these trees were killed by a fungus that was spread through the tree roots and the waters of the canal. Many places on the canal have newly planted trees to replace the Plane Trees. It is one of the reasons that the Enchanté now has a sunshade. Make sure you look for a boat that is air-conditioned like the Enchanté if you are visiting in the heat of the summer. 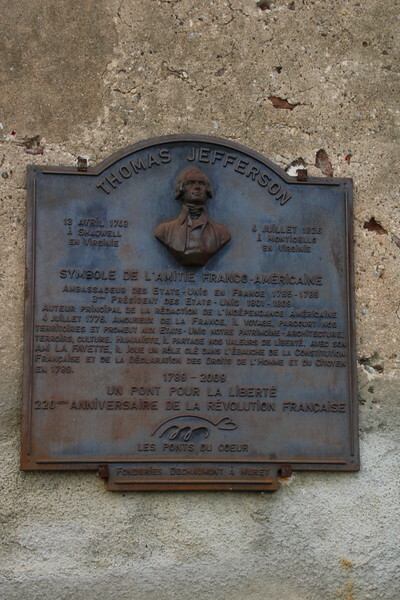 Where we boarded at Le Somail we saw bridge with a plaque dedicated to Thomas Jefferson who visited the Canal du Midi to understand more of its operation while he was ambassador to France. Another historic oddity we stumbled upon was an optical semaphore tower in Marseillette which was one of a series of towers built in the time of the French revolution by Claude Chappe to carried coded military messages in the south of France. Of course what makes the canal work are a series of locks and aqueducts which are one of the highlights of cruising the canal. The locks are run by lock keepers. They open at 9am stay open until 7pm most of the season except for an hour at lunchtime. The lock keeper no longer has to turn a big manual wheel, on this section, to open or close the locks but has a remote control. But much of the rest of the process is unchanged since the canal opened. The locks on the Canal du Midi have an unusual oval shape which I have not seen on later canals. Riquet believed that this would make the locks stronger. The captain has an easier job steering into the lock on the run uphill on the canal when he can see the large metal gates. At each lock there was a traditional lockkeeper’s house. On each was a plaque that said how many meters it was to the next locks in each direction. Some of the lockkeeper’s houses were a bit more unusual. At least two had the work of local artists. 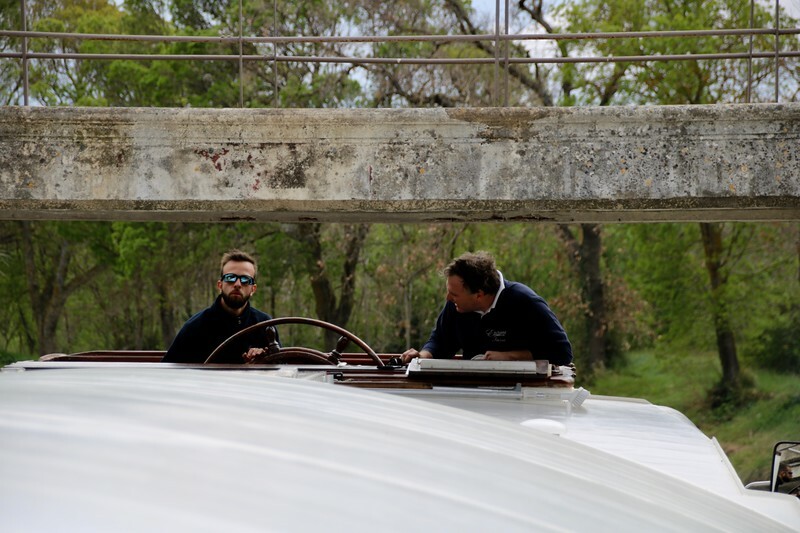 One of the members of the crew will be on the shore and will tie down the Enchanté in the lock before the doors are closed and the lock is flooded so you can rise to the next level of the canal. The best time to get on and off the boat is before and after it starts cruising via the gangway or in the locks when it is tied off. 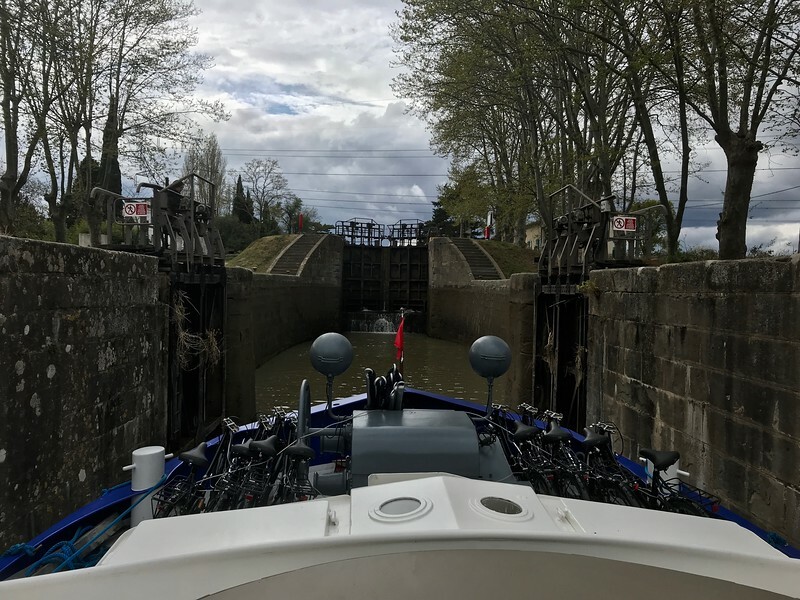 You just alert the crew ahead of time and at the last lock (some locks are doubles and triples) they will wait until the level of the boat is at the level of the ledge and give you a hand as you cross over. As I write this it is a bit before 10am in the morning and in the main indoor living space my wife is checking the news on her phone, using the wi-fi and the only two other passengers are visiting our captain Morgan in the wheelhouse. We interact the least with the captain whose domain is the wheelhouse and who is responsible for the boat and for getting us safely to our destination. Our chef Sylvain has started on dinner in the open kitchen just past the glass dining room table. 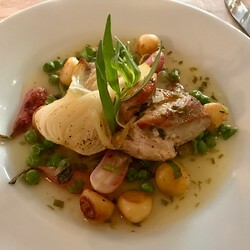 He is preparing a dish with a celery root ball to go with the duck for tonight’s dinner. 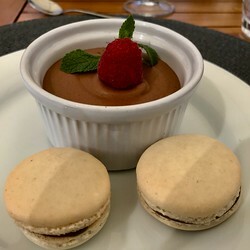 All day long he is busy in the kitchen as we have a three course meal at lunch (appetizer, main and dessert) and a four course meal at dinner (appetizer, main, cheese and dessert). Passengers are welcome to ask questions or learn how to make a certain dish or welcome just to eat heartily as has been our choice. 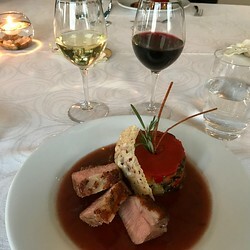 Each meal has been a pleasure to see as well as a pure pleasure to eat. 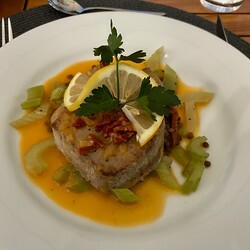 For years I have told people I don’t like fish, but Sylvain has made me a liar. 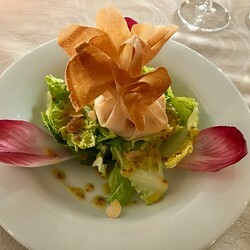 All meals are made with what is fresh and what is in season. While Sylvain is busy in the kitchen our two hostesses Agata and Manora are keeping busy. Agata was laying out a buffet breakfast by 7am with fruit, cheeses, fresh local pastries, cereal and eggs cooked on request. It is Manora’s turn to clean the cabins and I last saw her washing the windows below decks. Our tour guide Claire is off in the van somewhere in the countryside. She makes the early morning run for fresh pastries, each day from a different bakery along our route. She will show up at the next set of locks to handle the ropes to tie up the barge as the lock fills. Later this afternoon we will hop in the van on an excursion. It would be wrong to not pause here and say that the food on the Enchanté was one of the highlights. 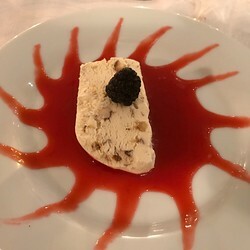 The ingredients were fresh, the plating was gorgeous and the food was delicious. 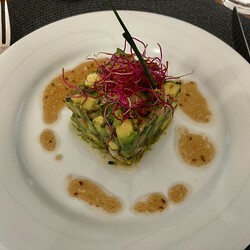 Here is a sample of some of the dishes we ate. I do not have the recipes for them but we did get a demonstration of how to cook salmon in a rock salt and egg white crust. We did spend a fair amount of time off the boat. 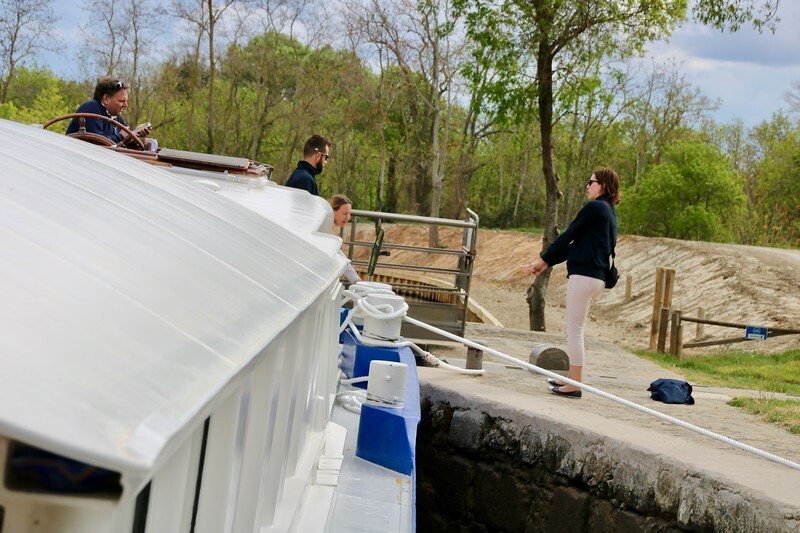 Some of it was biking or walking along the towpath but much of it was spent with Claire, our tour guide, exploring the countryside in the ship’s van on tours designed by Louisa Gronow who is a certified tour guide. We had one excursion per day. 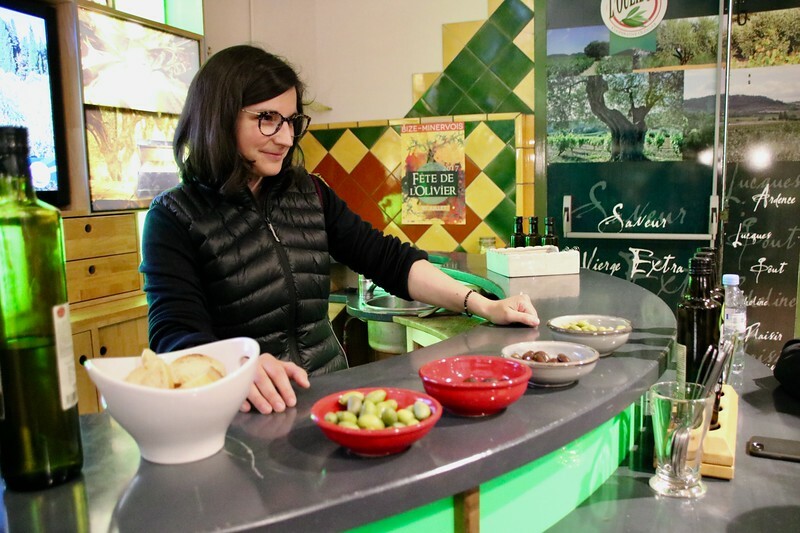 Our excursion on the first day started at an olive processing coop where we learned more about the production of olives both for the table and for olive oil. Table olives are still hand picked because the appearance is important. For the production of olive oil you can shake the tree or rake the olives for more efficiency. Table olives like the region’s famous Lucques olive, the green gold of the Languedoc, have to be cured to take away the bitterness. One method, the greek method, is to sit them in salt for 4 months and then rinse them in fresh water 3 times for a week each time. Olives for oil are crushed with the pit which has a natural preservative. 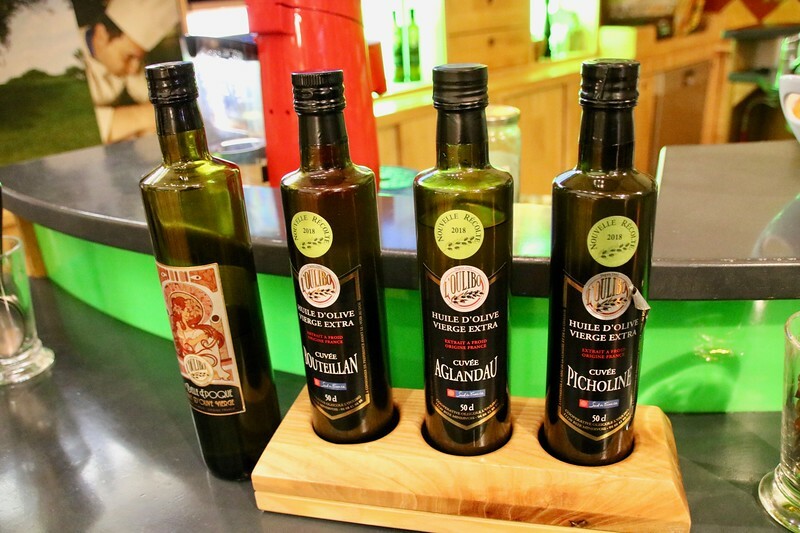 We tasted 4 different olive oils. To my palate the differences between them were subtle. It takes 6-10 kilos of olives to make a liter of olive oil. The leftover solids can be used for soap or for fertilizer. 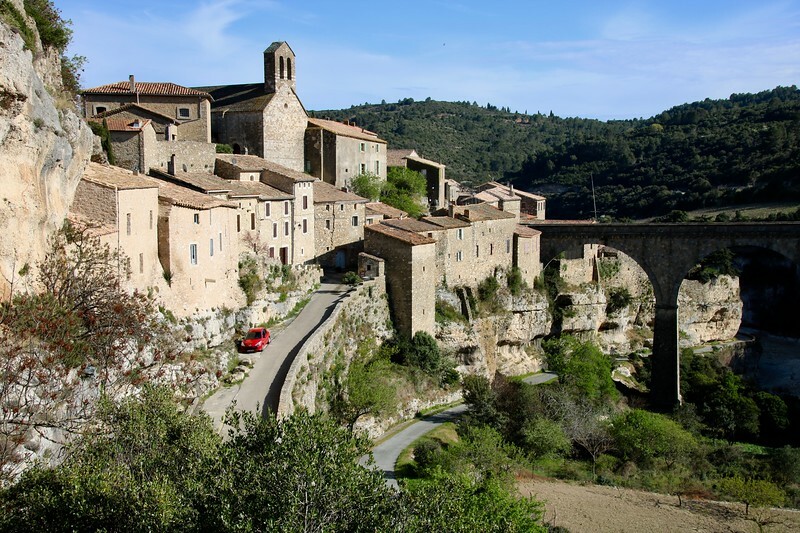 Also on the first day we visited Minerve which is a village which has been named to the list of “Plus beaux villages de France” (most beautiful villages in France). To be on the list a village needs 2 or more special historic or scenic characteristics. 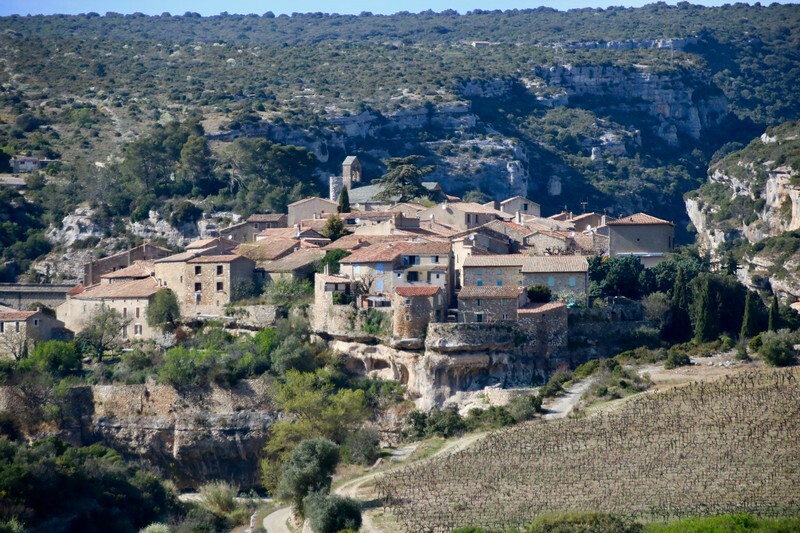 Minerve is a beautiful village built on a rock outcrop between two rivers in the hills. It was also the site of a siege during the Albigensian Crusade (1209–1229) against a heretical sect of Christians known as the Cathars. The village sheltered Cathar refugees until a trebuchet (known as the bad neighbor) was used to knock out the village well. 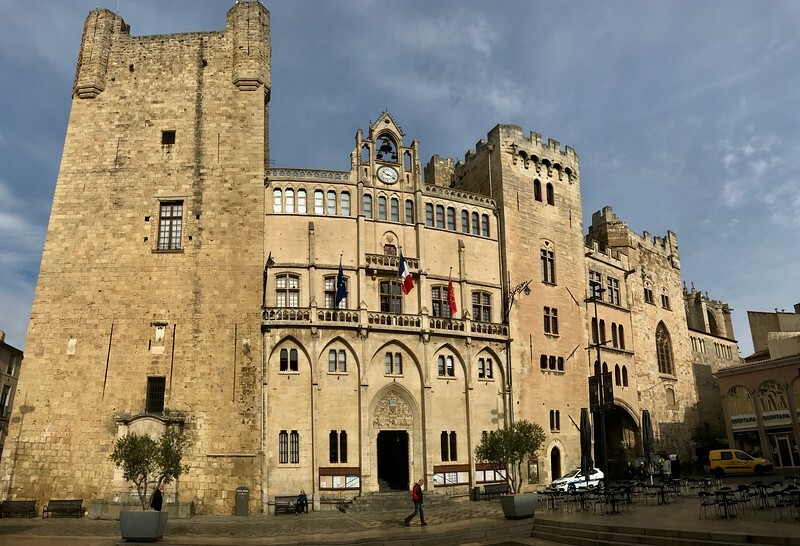 On the second day we traveled back to Narbonne where we had arrived by train from Paris to spend some time exploring the city. 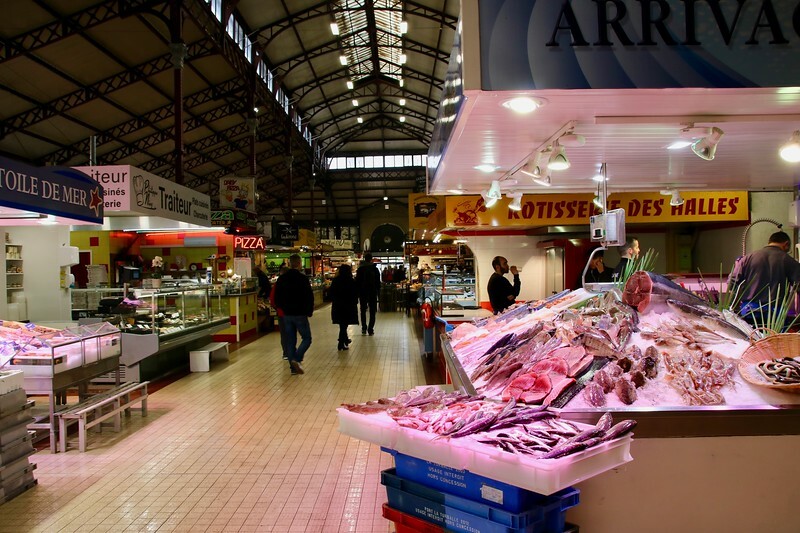 We explored the central market where many from Narbonne do their shopping at the many stalls or eat a lunch out at one of the small restaurants. 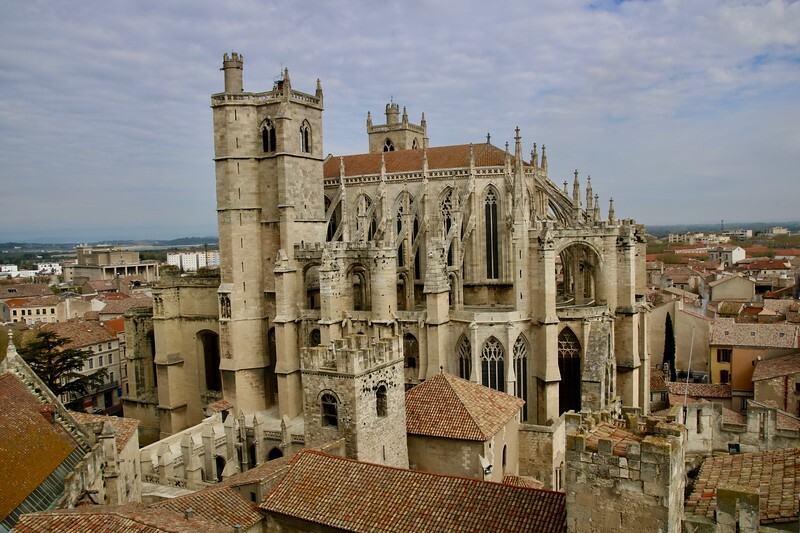 We also visited the unusual cathedral in Narbonne which is the 3rd tallest in France but only about a 3rd the normal length. The original plans to knock down the city wall to make the cathedral full size were opposed by the citizens who preferred the protection of the city wall. 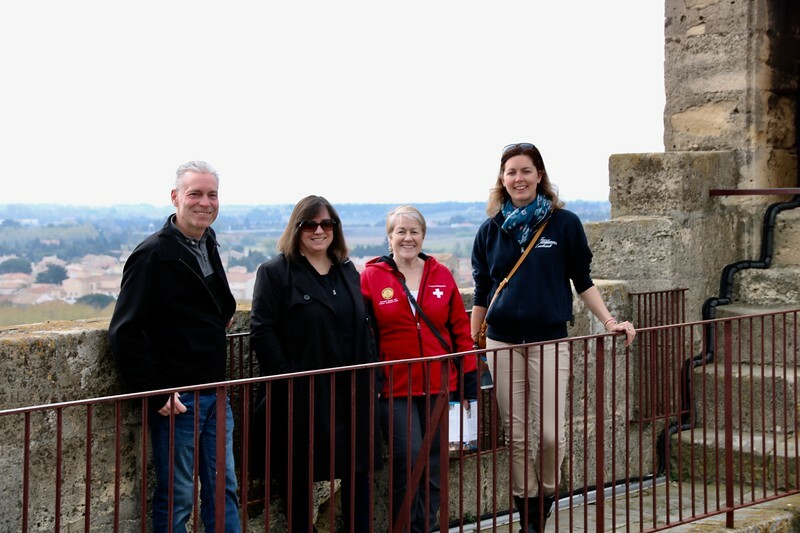 At the Archbishop’s Palace we climbed the tallest tower to get a view of the city including the Canal de la Rabine which bisects the city. In front of the palace you can find an excavation of the original roman road which ran through the city. 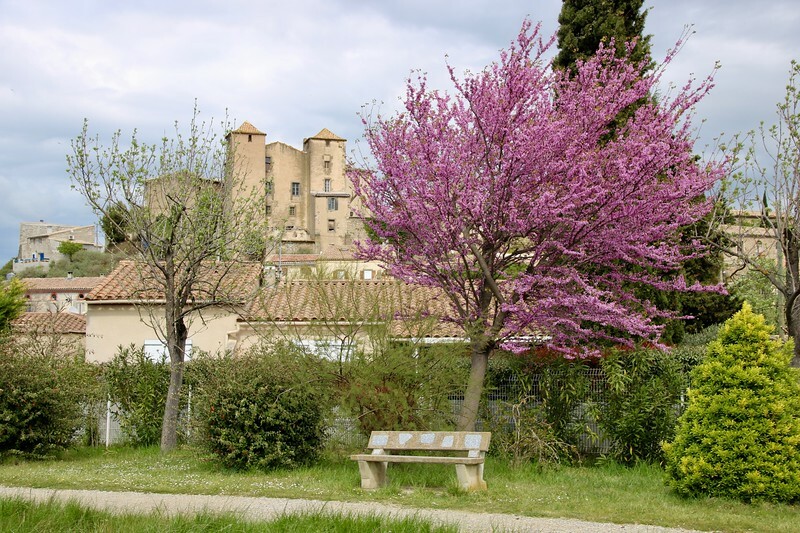 Lagrasse is another Plus beaux villages de France. 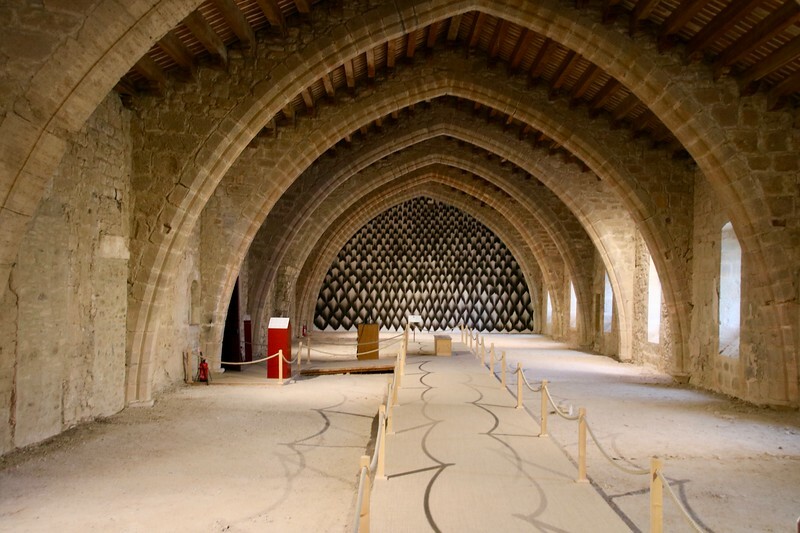 It is the home for an important abbey which was founded in the 800s with a charter from Charlemagne. The abbot here at one time was in charge of 100 different churches or monasteries in the region. Half of the abbey is now owned by the government and can be toured. Major renovation work has been done on that portion of the site. The other half of the grounds is still an abbey with 30 monks. 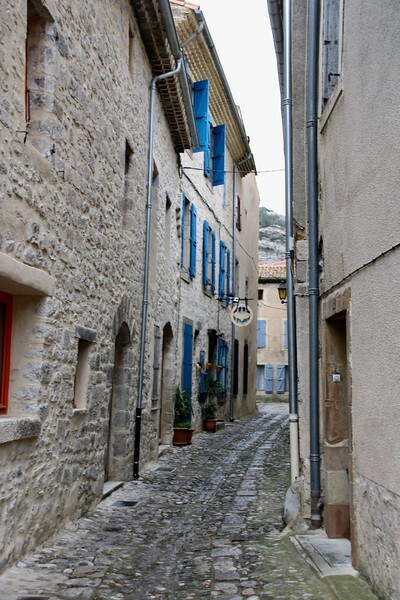 The town of the Lagrasse has a number of artisans who have workshops in the old medieval center. 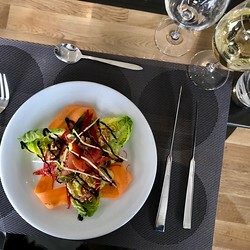 We tasted a lot of local wine on our cruise, having at least 2 different wines each night, but we also did an excursion on the 4th day to a local winery Domaine Des Homs. We tried some single varietal wines but a typical red wine in the region is a blend of 2-4 grapes: Grenache, Syrah, Mourvedre, Carignan. To be certified in the local A.O.P. (Appellation d’Origine Protégée) protected wine designation a wine has to have at least 2 of these varieties. 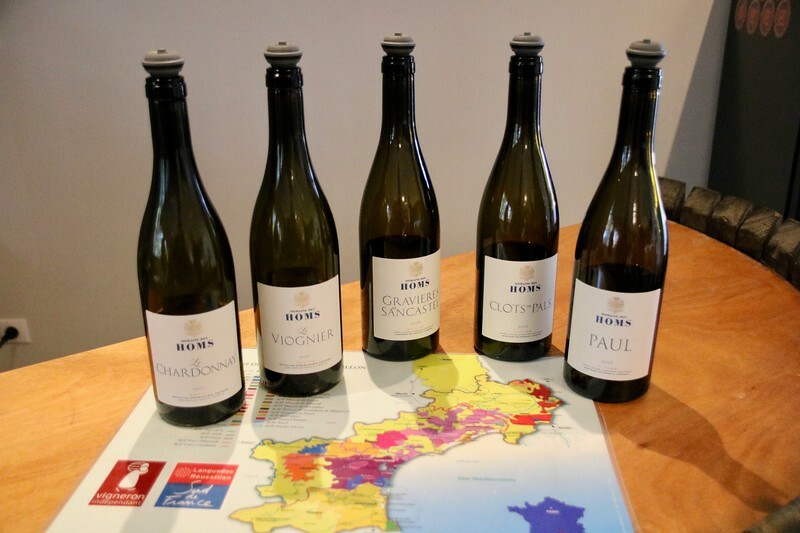 But we did also enjoy some of the single varietals at Domaine Des Homs like the Grenache which they described as “simple and uncomplicated”. It was also the name of their dog who, being a dog, was also simple and uncomplicated. 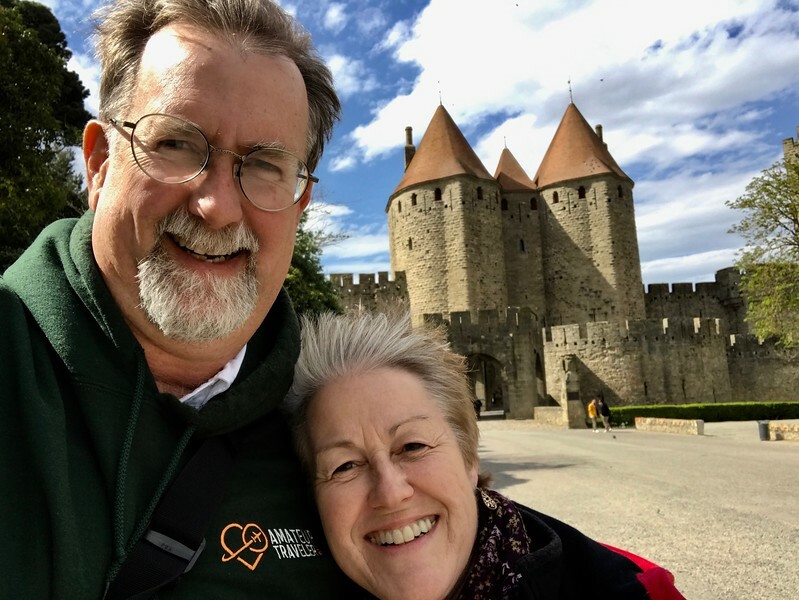 The highlight of the touring and the reason that I booked this cruise was a visit to the walled fortress city of Carcassonne. 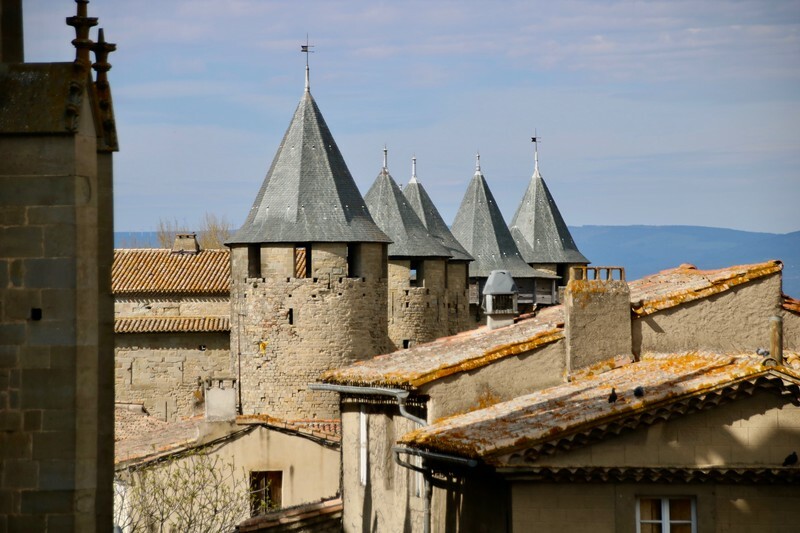 Carcassonne is no only a pretty good board game, but one of the best preserved walled cities in Europe. 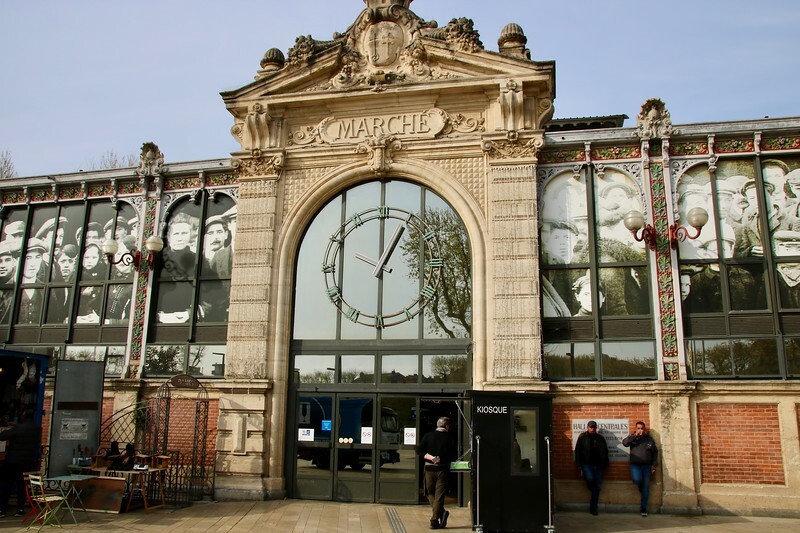 It was originally decreed to be demolished in 1849 but outcry from locals and historians was able to change the plan from demolition to reconstruction under the architect Eugène Viollet-le-Duc. Viollet-le-Duc also worked on such well known projects as Notre Dame Cathedral, Mont Saint-Michel, Sainte-Chapelle. Squatters were living in the space between its double walls when he visited the city. 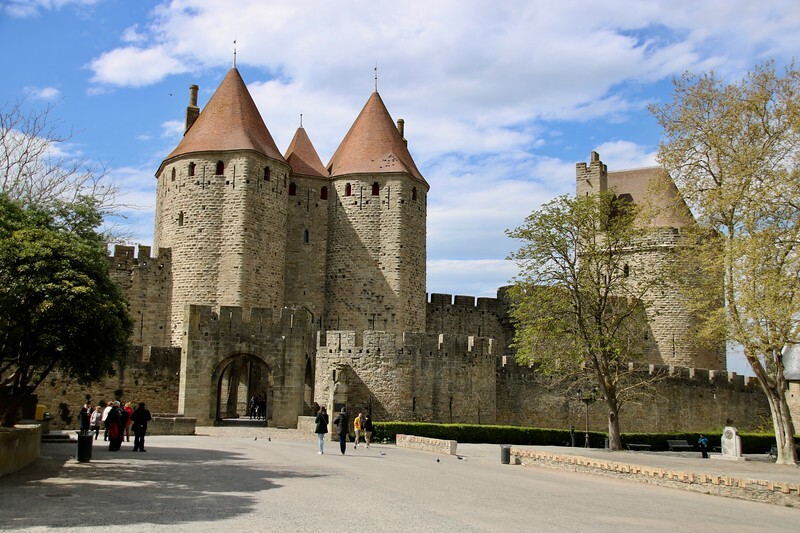 Viollet-le-Duc’s first decision was restore Carcassonne to what period. 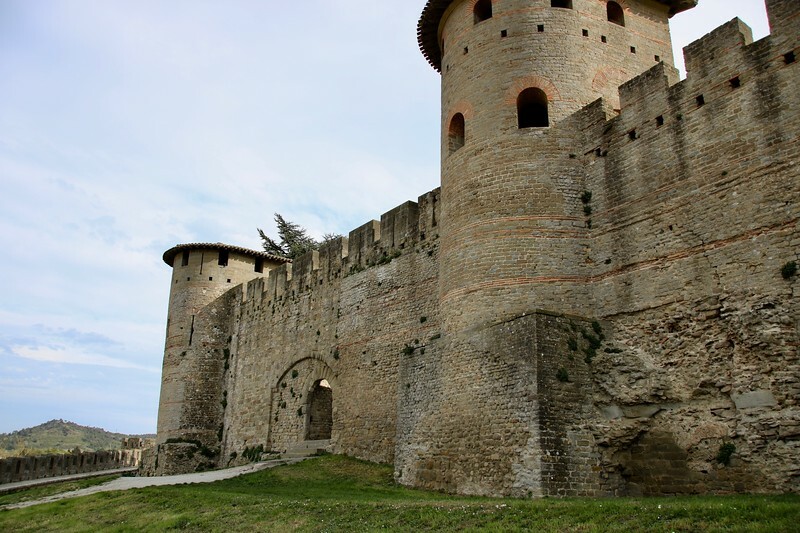 This is a city whose walls date back in portions to Roman walls. 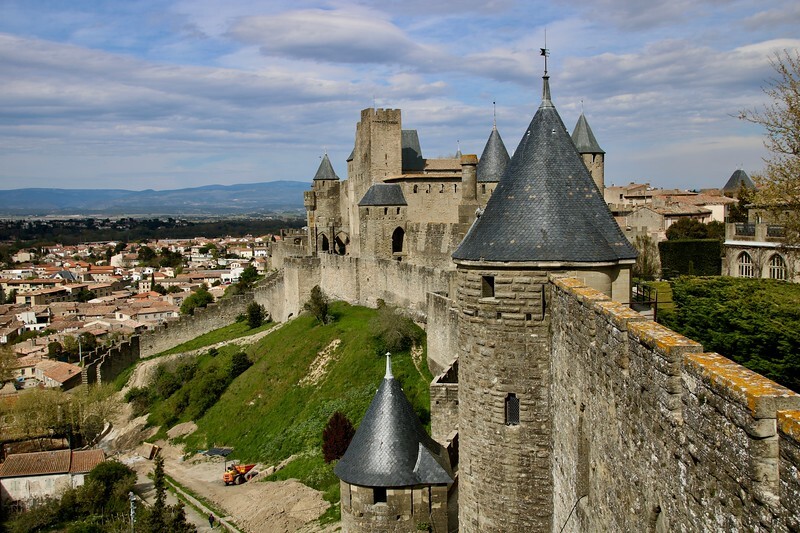 He decided to restore the fortress to the construction done just after the Cathars were expelled from Carcassonne in 1209 during the Albigensian Crusade. Some of the early work definitely has some historic flaws as the pointy black roofs for some of the spires would fit better in Austria than in the Languedoc. Some of the later sections with red terra cotta tiled roofs are more historically accurate. Notice the line of brick work on some of the walls that is a sign of a Roman wall. 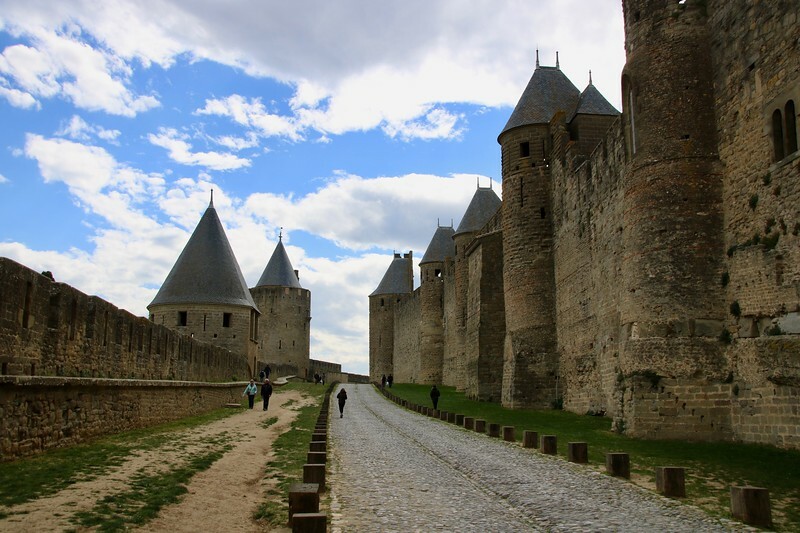 Carcassonne is a very touristy city, or at least the old city is. But it is also wonderful. 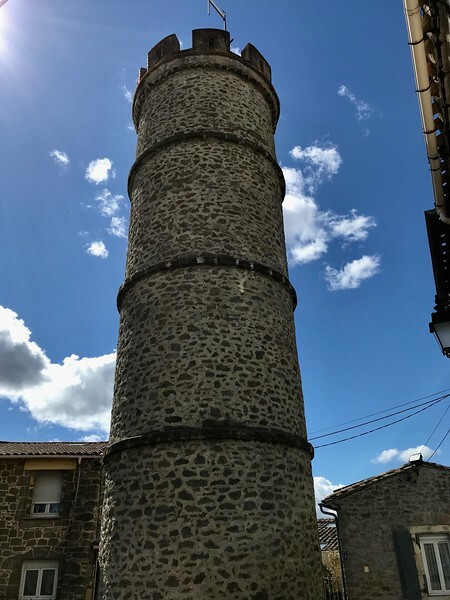 Yes you can buy a plastic sword or get your picture taken in armor, but you can also stroll the old walls of this city as they would have looked… more or less… in the 1200s. 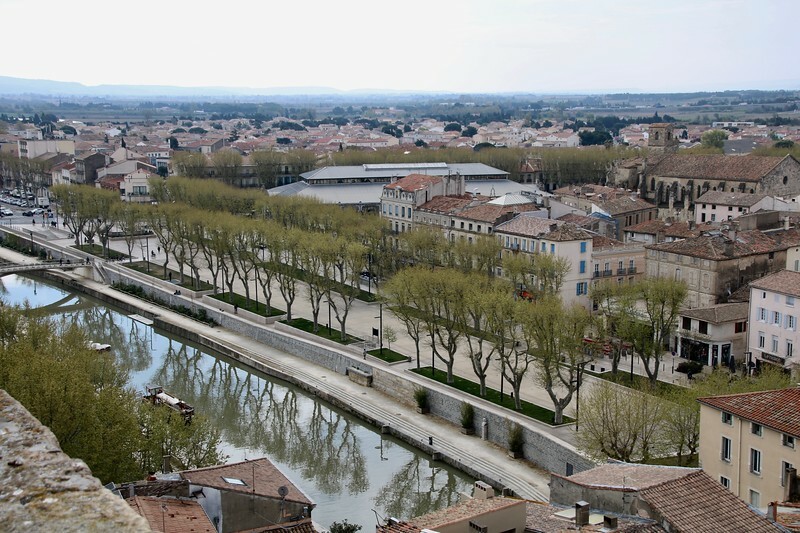 Both Carcassonne and the Canal du Midi itself are UNESCO World Heritage sites to discourage someone in the future from deciding… again… to tear them down. 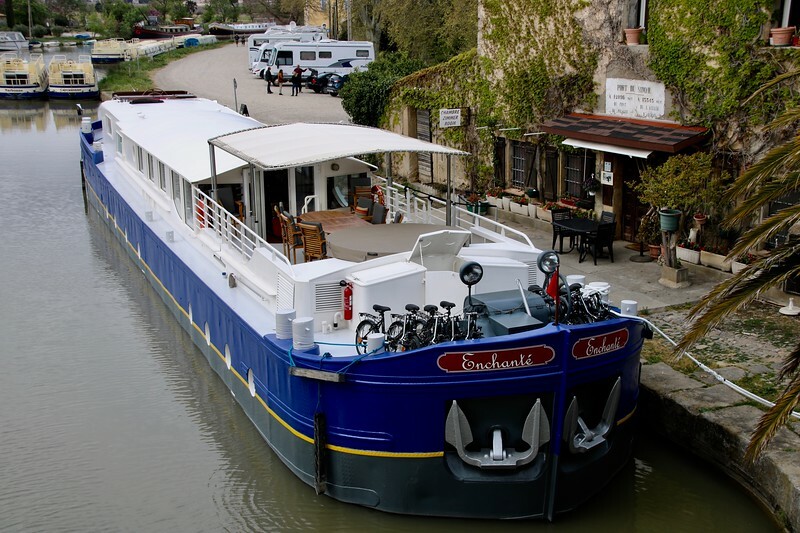 The region of Canal du Midi is a beautiful place to visit and the luxury hotel barge Enchanté is a particularly enjoyable way to tour it. My thanks to European Waterways, the owners and crew of the Enchanté for treating us in a manner to which we would like to become accustomed. This cruise was sponsored by European Waterways but all opinions are my own. 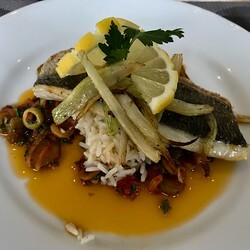 Looks lovely – but I’d wind up eating way too much! BTW, those are plane trees, not plain trees. 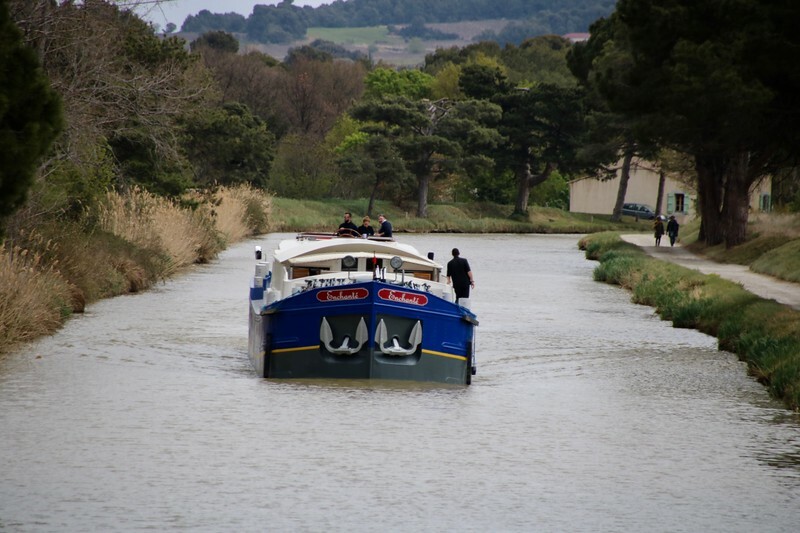 I am very eager to visit “The region of Canal du Midi”. You explained in detail about this place.